The assembly election results from India’s northeast are a reminder of the nation’s political division. The election results for the assembly polls in the northeastern Indian states of Meghalaya, Tripura and Nagaland were announced last week. The media hype generated by the presentation of the annual budget, however, has drowned out an important message inherent in the outcomes: Politically and geographically, these northeastern states share a tenuous link with the rest of the country. The most striking result came from Tripura, a state that shares three-fourths of its border with Bangladesh. 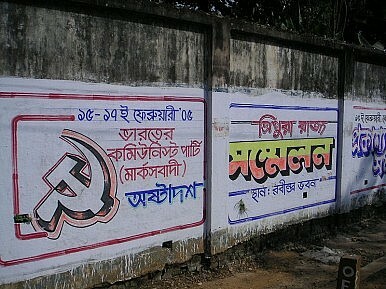 In Tripura, under the leadership of Manik Sarkar, the Communist Party of India-Marxist (CPI-M) secured its fifth consecutive victory. Before the announcement of the outcomes at the state’s polls, some wondered whether the remnants of India’s political Left would remain intact. Indeed, if the CPI(M) lost the election in Tripura the political Left would have been electorally marginalized, especially after losing its foothold in West Bengal and Kerala at the polls in 2011. Not long ago Tripura was engulfed in tribal warfare, with neighboring Bangladesh providing an easy sanctuary for insurgent groups. However, political concessions and representation in the form of autonomous regions for the state’s various tribes assimilated the local indigenous people into the democratic mainstream. Since the late 1990s the state has been at peace, which has facilitated not only democratic consolidation but also economic development. Meanwhile, the electoral results were also interesting in Nagaland. A regional group, the Naga People’s Front (NPF) led by Neiphiu Rio, trounced the Congress Party for the third time in a row, winning 37 of 59 seats, a gain of 11 seats since the last polls. Political analysts attribute this landslide victory to the NPF’s developmental work and ability to maintain relative peace in the mountainous state, which shares its northern border with Myanmar and was home to India’s first separatist movement. Starting in the 1960s, thousands died across the state in a violent revolt against New Delhi’s rule. However, in 1996 the main separatist group led by the Isak Muivah faction of the National Socialist Council of Nagaland (NSC-IM) reached a ceasefire agreement with the Indian government and has since been holding peaceful negotiations with New Delhi. Meanwhile, in the case of Meghalaya, which borders Bangladesh, voters backed the incumbent Congress Legislature Party-led government under the leadership of Mukul Sangma. The party clinched 29 of 60 assembly seats, almost half, for the first time in the history of the state. Some have attributed the ruling party’s win to Mukul Sangma’s efforts to develop the infrastructure of the state’s rugged terrain. As these three tiny states do not significantly impact New Delhi’s electoral and political calculations, the results of the recent elections have failed to register in the national consciousness. But the larger message they contain cannot be ignored. For one, in all three states more than 80 percent of the population voted; far more than the national average, which hovers around 50 to 55 percent. This democratic mobilization has contributed to newfound peace in an historically turbulent region that is critical to India’s Look East Policy. Further, the poll results serve as a reminder to the Bharatiya Janata Party (BJP) of its limitations as a national party. In fact, the BJP has virtually no presence in these three states. Finally, the verdict in Tripura boosted the morale of the Left, which has been pushed to the electoral precipice after losses at the polls in other parts of India. In turn, a resurgent Left could challenge the ruling Trinamool Congress in West Bengal, which is touted as a potential ally of the BJP. This challenge from the Left could cause waves for the BJP as the opposition accelerates its push for power in New Delhi in the 2014 general elections. Things could get interesting next year when the whole nation goes to the polls.